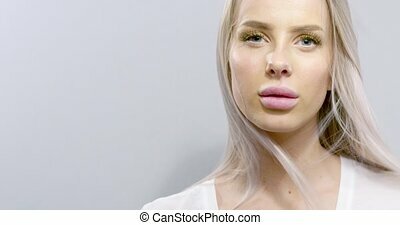 Beautiful young woman applying dry cosmetic tonal foundation. 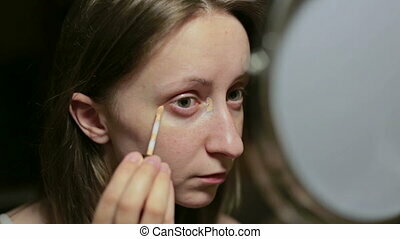 Studio portrait of a woman applying dry cosmetic tonal foundation on the face using makeup brush. attractive woman putting on make-up. 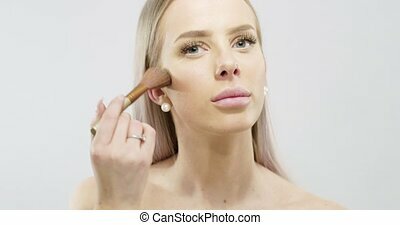 Studio portrait of a woman applying dry cosmetic tonal foundation on the face using makeup brush. 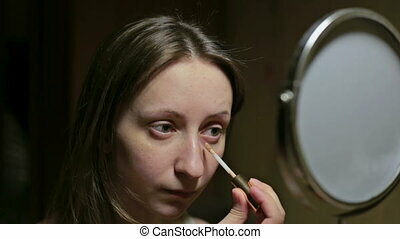 Attractive woman putting on make-up. Cosmetic concept. Filmed in slow motion 6K. Closeup studio portrait of a woman applying dry cosmetic tonal foundation on the face using makeup brush. 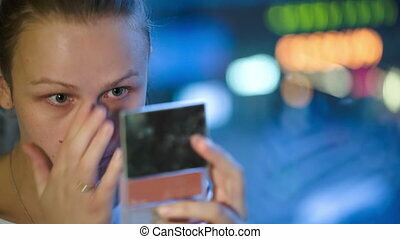 Attractive woman putting on make-up. Cosmetic concept. Filmed in slow motion 6K. 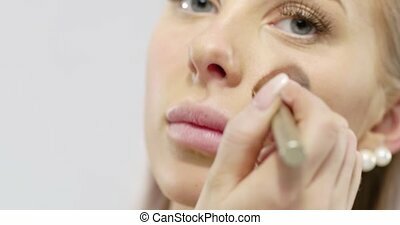 Close-up studio portrait of a woman applying dry cosmetic tonal foundation on the face using makeup brush. Attractive woman putting on make-up. Cosmetic concept. Filmed in slow motion 6K. Skinecare studio portrait of a beautiful woman with long blonde leaning head on her hand. Attractive woman posing in studio over white background. Skincare concept. Filmed in slow motion 6K. Portrait of a beautiful woman with long blonde hair touching her skin. Attractive woman posing in studio over white background. Skincare concept. Filmed in slow motion 6K. Skincare portrait concept of a beautiful woman with long blonde leaning head on her hand. Attractive woman posing in studio over white background. Filmed in slow motion 6K. Close-up portrait of a beautiful young woman touching her skin. Attractive woman touch her skin. 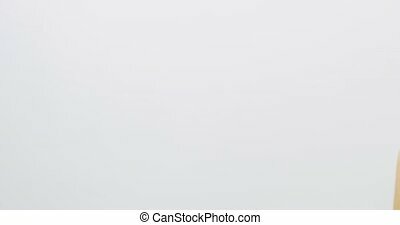 Skincare concept with white background.